Rely on Thetford, follow our tips, and as soon as the sun starts to shine in spring, you can enjoy carefree holidays again! Each year you have to do a lot of things to prepare your vehicle for the winter storage, with these 5 tips from Thetford you don’t have to worry anymore about your toilet and refrigerator in the winter. One of the most important things to do, is to ensure your RV is clean and fresh for winter storage. 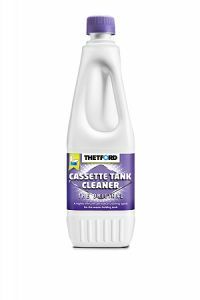 In the Thetford range you can find 3 products that makes the major clean-up easier. Use Bathroom Cleaner for all plastic surfaces. Wipe the surface with a soft, dry cloth to give it a nice, glossy finish. Use Toilet Bowl Cleaner for the inside of the toilet bowl and use Cassette Tank Cleaner to clean the waste-holding tank periodically. This product easily removes deposits and prolongs the life span of your waste-holding tank. Toilet Tip 2; Do not leave water in your tanks Make sure there is no water left in your RV before leaving it in storage. This applies to your fresh-water tank, grey-water tank and black-water tank/waste-holding tank. Does your toilet have its own flush-water tank? Fully rinse this out so that no more deposits are left behind. Then empty it completely before parking your camper or caravan into storage. Whilst in storage, we recommend leaving the blade open to prevent damage to the blade and to loosen the cap of the pour out spout, which will ventilate the waste-holding tank. By leaving the blade open, you prevent the blade seal from drying out. Use Thetford Seal Lubricant to spray the seal and the waste-holding tank blades, do this regularly and before storage. This product has been specially developed for our toilets and is absolutely safe to use. Use it on door seals, locks, hinges, awning rails, bicycles, etc to prevent squeaking, creaking or leaking. To prevent odours and mould in the refrigerator, keep the doors to your refrigerator and freezer, open during storage. External doors are equipped with a storage lock. In our user manuals you’ll find an extended description of these winter storage tips and also how to use your RV during the winter.